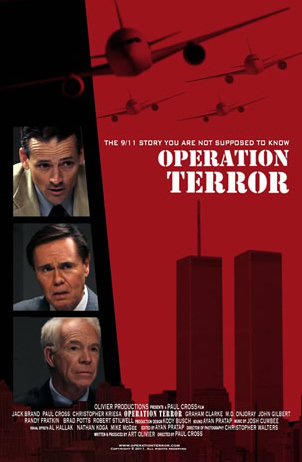 James McCullough from the mysterious “Council” gives a special assignment to CIA agent Aaron Delgado to attack the World Trade Center and the Pentagon and pin the blame on Muslim Terrorists. Delgado and fellow agents, Phillip Singer and Chase Jordan, work with a group of unsuspecting engineers to develop unmanned jets that will hit their assigned targets. The Army and the FBI begin to uncover the plot, forcing Delgado to intervene. The CIA agents also have to deal with an increasingly suspicious George Poole, the lead engineer working on the drones, who becomes skeptical on how the remote controlled planes will be used. A battle between good and evil ensues as the plot to attack America becomes a hard-hitting reality. Exclusive: Q & A afterwards with the Movie Producer Art Olivier and Richard Gage, AIA, of Architects & Engineers for 9/11 Truth. Bonnie Faulkner of Guns & Butter will MC. Wheelchair Accessible? Yes! The Ramp is on Bonita Street! Tickets will be available at the door as supplies last. Click here to Download the Poster. Please help to promote by posting! !